The most important follow-up measure of the Gnyana Yagnyas (discourses) is the Study Group program. The basic concept of the Study Group is to study the scriptures by those who have a curiosity and thirst to benefit from the perennial wisdom of the Rishis. Thus, to the sincere and diligent student, the Study Group technique provides an opportunity and a forum for gaining a deep and quick perspective of our scriptures. The forum, in the Satsang atmosphere also fosters and develops brotherly understanding amongst the members and strengthens the “One Family” concept. How Study Groups Are Run? Each Study Group member is allotted a portion of the text. During the subsequent class the Sevaka summarizes the proceedings of the last class and requests the allotted member to offer his/her contributions. After the member has finished his contributions and raised questions, the Sevaka requests other members for their supplementary contributions on the topic under discussion, and also answers to questions raised. Repetition of stanzas and word meanings given in the text under study is essential in understanding and in becoming familiar with Sanskrit verses. After the contributions are over, the Sevaka, as a member of the class also makes his/her contributions. After the 60 minutes of class time, the Sevaka will punctually close the class with the recitation of a prayer by all and quietly disperse with “Hari Om”. By following the procedure with sincerity and enthusiasm, members get the cream of the wisdom of the text under study by the technique of cooperative thinking. Individuals living an integrated life make a healthy society. Such societies help to build a strong nation and peaceful world. 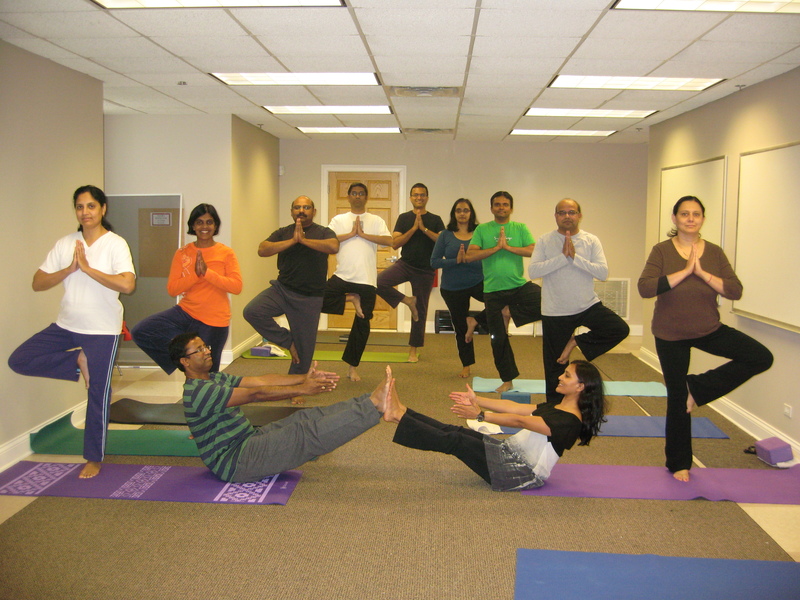 Chinmaya Mission Yamunotri offers Yoga classes periodically at a reasonable price. Please Click here for more information on the classes. Hatha Yoga also called Hatha Vidya is a system of Yoga that was introduced by Yogi Swatmarama, a sage of 15th century India, and compiler of the Yoga that was introduced by Hatha Yoga Pradipika . In this treatise Swatmarama introduces Hatha Yoga as a preparatory stage of physical purification that makes the body fit for the practice for higher meditation. The Asanas and Pranayama in Raja Yoga were what the Hindu Yogis used to physically train their body for long periods of meditation. This practice is called shatkarma . The word Hatha is a compound of the words Ha and Tha meaning sun and moon, referring to Praana and Apaana, and also to the principal nadis (energy channels) of the subtle body that must be fully operational to attain a state of dhyana or samādhi . According to the Moneir-Williams Sanskrit Dictionary, the word "hatha" means forceful. It is a strong practice done for purification. In other respects Hatha yoga follows the same principles as the Raaja Yoga of Patanjali including moral restraint yama and spiritual observances niyama. Hatha Yoga is what most people in the West associate with the word "Yoga" and is practiced for mental and physical health throughout the World.